Have you or a loved one been killed or seriously injured due to the negligence of a hospital or physician here in Mississippi? Has a family member been involved in a wreck with a big rig, mack truck or 18-wheeler? 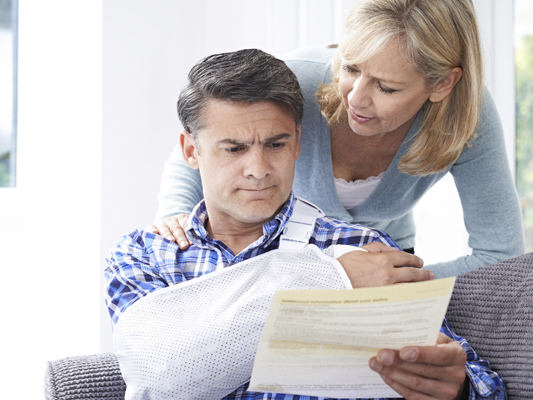 Have you been injured as a result of someone else’s negligence? If so, it is important that you contact a qualified Mississippi personal injury attorney immediately. It is critical that an immediate and thorough investigation is performed to uncover any possible evidence of negligence and to preserve the scene. his efforts to prove the plaintiff ‘s very real physical damage. craniotomy. “The process was incredibly intricate,” he recalls. members if they aren’t involved on those boards themselves. If you or a loved one is in need of legal assistance in Mississippi, call John D. Giddens Law Firm at (601) 355-2022or Toll Free at (888) 335-2022. The initial consultation with our firm is free of charge, and if we agree to handle your case, 99% of the time we will work on a contingency fee basis, which means we only get for our services if there is a monetary recovery for you and your family. In many cases, a lawsuit must be filed before a certain date, known as a statute of limitations which is the cutoff for claims being filed. Please call right away to ensure that you do not waive your right to possible compensation. 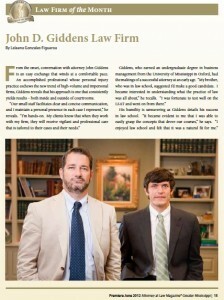 The text above is from our article in Attorney at Law Magazine of Mississippi where the Giddens Law Firm was honored as law firm of the month. Click to see a full pdf version of the Attorney at Law Story.